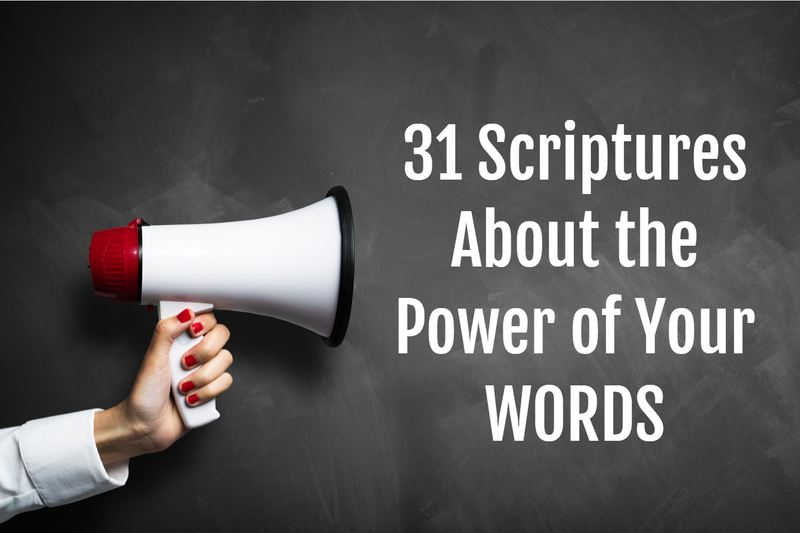 Learn how to take authority over your life with these 31 scriptures about the power of your words! Words. Use them right and they’ll move mountains. Use them wrong and they can cause your entire life to go up in smoke. Don’t ever underestimate the power of your words. Satan doesn’t. He works constantly to get you to turn them in a negative direction. He’ll fire darts of pain and sickness and discouragement at you just to get you to speak faithless words—words that will eventually send your life up in smoke. Don’t let him succeed! Make no mistake, your words aren’t meaningless or powerless in your life. They have creative power, just as God demonstrated when He created the heavens and the earth with His words. Now, you have the authority to do the same thing here on earth. Then keep your tongue from speaking evil and your lips from telling lies! Wise words bring many benefits. The one who guards his mouth preserves his life; the one who opens wide his lips comes to ruin. The heart of the godly thinks carefully before speaking. Like cold water to a weary soul is good news from a distant land. When she speaks, her words are wise, and she gives instructions with kindness. The words you say will either acquit you or condemn you. It’s not what goes into your mouth that defiles you; you are defiled by the words that come out of your mouth. For assuredly, I say to you, whoever says to this mountain, “Be removed and be cast into the sea,” and does not doubt in his heart, but believes that those things he says will be done, he will have whatever he says. The tongue is a small thing that makes grand speeches. But a tiny spark can set a great forest on fire. And among all the parts of the body, the tongue is a flame of fire. It is a whole world of wickedness, corrupting your entire body. It can set your whole life on fire, for it is set on fire by hell itself. If you want to enjoy life and see many happy days, keep your tongue from speaking evil and your lips from telling lies. When you take control of your words, you take back your life! As long as your words are in line with the Word of God, Satan can’t touch you. As you practice, don’t be discouraged if you miss it now and then. Just repent for anything wrong you’ve said and get right back on track. You will have what you say! Give voice to God's Word! Watch Kenneth Copeland and Bill Winston as they teach us how to think God’s thoughts and speak His Words. Make God’s Word the final authority in your life.